I don’t care for most of Gaga’s sartorialisms and it bugs me to see them discussed as “fashion” when they’re really more accurately described as costume – – or performance art. She is an Excellent Dress Wearer. An excellent anything-wearer, actually. She has confidence and attitude, which allow her to pull off the nuttiness she wears and are key ingredients in the recipe for Excellent Dress Wearer. But what she wears is less style than it is statement. Which is fine, except that you people keep saying she’s a style icon. She is not a style icon. She actually appears to have little personal style of her own. It’s All Costume, All The Time. Not that I have anything against Costume. Please. ….But it’s not the same as style. So, about the gown. THE GOWN. 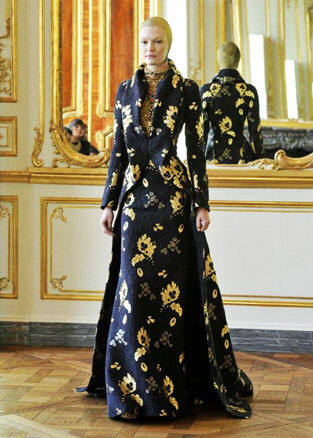 I cry hungry tears of want…..for…..this……gown. The autumnal colors, the painterly Renaissance riffs, the explosion of the skirt, the regality, the mossy tulle, the breast platery at the neck. The Sistine Chapel must have closed its eyes and sighed, shedding chiffoned layers of its ceiling-ed self floating down into mortal hands to make this gown. 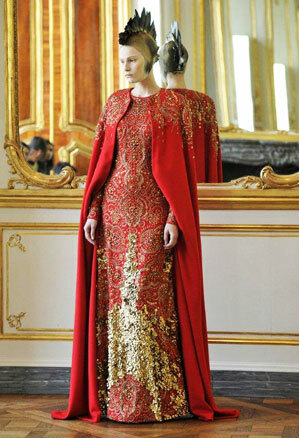 That it is part of the late Alexander McQueen’s last collection only adds to the presence of the divine in its folds. 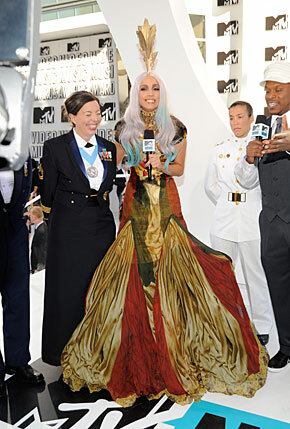 This gown has such stature and Gaga, happily, is doing it justice. Enormously high shoes essentially put her standing on a box. She is not tall enough for this gown on her own, so standing on a box allows her to carry the full gown. The headdress is golden and regal, but not quite a crown. It is made of feather arrows. Crowns are for the entitled and protected. Arrows are for warriors – – golden feather arrows for warrior queens. Even the sky-lavender-gray wig works. I mean, this is not a woman at an awards show. 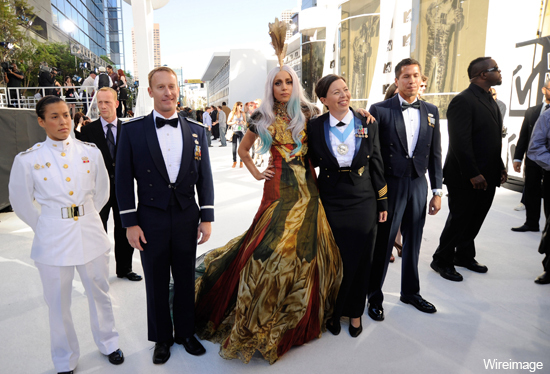 This is an otherworldly warrior queen greeting her subjects. Did you really expect her to have human-hued locks neatly tied into a chignon?